A comparison of the Polish Round Table and the Tiananmen Tragedy show that non-violent resistance movements need to be clear-headed in the moment of negotiation and transition. The next moves by the democratic movement in Egypt will determine the political shape of the country for a long time to come. It should learn from Solidarity's success in 1989. In recent days it was hard not to recall Tiananmen Square when we saw the Egyptian army on the streets of Cairo and tanks rolling toward Tahir Square where hundreds of thousands of people have been calling for democracy. Despite the Egyptian army’s statement on 31 January declaring that it would not use force against the people, plainclothes police and armed thugs organized by the regime have attacked nonviolent protesters and foreign journalists in two brutal days of repression this week, designed to frighten off the protesters and prevent the world from witnessing the repression. So far, however, protesters are standing their ground, as of this writing on 3 February. The Egyptian democracy movement, which is what it should be called at this point, including its nominal leader, Mohamed ElBaradei, continue to say that Mubarak must resign for talks to begin. Whether or not Mubarak resigns or is deposed soon, there will still be the institutions and actors of the old state for the movement to contend with, and the Egyptian democratic movement would benefit from looking at historical models for negotiating a successful democratic transition away from authoritarian rule. The failure to know how to negotiate with an authoritarian regime that wants people off the streets was, it has been argued, one factor that led to the massacre of Tiananmen Square in China in 1990. But half a world away, in the same historical moment as Tiananmen, the Polish people and the Polish regime turned to another method to redeem the chance for democratic transition. They chose a dialogue of equal partners to convene roundtable talks where all major opposition groups were represented and negotiated the political future of their country. Mindful of what had happened in China, the Polish opposition was concerned that if their demands were too extreme it might push the hardliners in the communist party to take charge and crush the chance for real democracy. The Chinese government chose repression while Polish autocratic rulers opted for a compromise. Despite many significant differences between the Chinese protests of 1989 and the current movement in Egypt, it is worth reflecting on the lessons of those events to see if there are insights for the current situation. The first and most obvious parallel is that popular resistance in both cases emerged almost spontaneously and was led mostly by courageous young people filled with enthusiasm and inspired by successful uprisings elsewhere. In other words, in both cases no long-standing infrastructure for resistance could facilitate ongoing mobilization and coordination, although a network of dissidents, unions and civil society has been established in Egypt, for example to circumvent efforts by the regime to shut down communication via mobile phone and the internet. One striking aspect of the Tiananmen movement was an apparent lack of strategic thinking – the Chinese students were novices at resistance, apparently without any formal understanding of how nonviolent struggle works. In their experiment with consensus decision-making and with a constant influx of new participants, the leadership of the movement was fluid and divided, especially with a struggle heavily centralized in Beijing. The deliberately loose organization, in some ways its strength, presented obstacles to strategic planning. Movement leaders who saw the vulnerability of having only one protest, however massive, were marginalized when they suggested long-term strategic moves not deemed sufficiently radical by other leaders (Zhao 2004). Moreover, the decentralized movement was unable in the end to sustain complete nonviolent discipline and a small group of protestors apparently began stealing weapons from the military and fighting with officers just a few hours before the massacre, thus giving the authorities an excuse for sending in the troops to clear the Square. Veteran nonviolent scholars Gene Sharp and Bruce Jenkins, observing developments in Tiananmen at the time, identified two strategic lessons: “First, a nonviolent occupation of a physical spot of whatever symbolic value is always risky for the protesters. They are easy for the opponents to remove.” If the students had withdrawn after negotiating for sustainable political space – which moderates in the Politburo were later shown to have been ready to consider -- they could have claimed victory and spread their message throughout the nation. A second strategic problem was “a failure to mobilize a large-scale massive noncooperation with the system by the very people whose work made its continuation possible,” i.e., the civil service, military forces, police, and communications and transportation workers (Sharp and Jenkins 1989: 6). There was movement in that direction, especially with supportive workers, organized by work units who marched together carrying a banner with the unit’s name, which reduced the potential liability to each individual participant, and thus expanded participation beyond student, intellectual, and journalist circles. In Egypt, the movement has the advantage of widespread support in the civil society, including escalating labor opposition to the Mubarak regime in recent years, and the announcement of the creation of new Federation of Egyptian Trade Unions with plans for a nationwide general strike for democracy and fundamental rights. In addition, key dissidents have studied intensively the lessons of previous successful nonviolent struggles and have thought strategically about how those lessons might apply to Egypt. In China, the students and their bystander supporters were able to exploit a rift within the armed forces, with a hundred senior military leaders sending a statement to Li Ping refusing to deploy units to “shoot the people,” just as the army in Egypt has committed to not shooting unarmed demonstrators. A related key aspect is the support by major Muslim religious figures in Cairo and a declaration that shooting at peaceful protestors is morally forbidden. The disavowal of repression by the Egyptian military was reflected not only in the military spokesman’s announcement that “the armed forces will not resort to use of force against our great people” and telling the demonstrators that the military understood “the legitimacy of your demands” but also in scenes from Liberation Square of protestors and soldiers mingling in good humor. This fraternizing of the military with the largely nonviolent insurgency may be part of what impelled Mubarak’s new vice president to offer negotiations. It will be necessary though not sufficient in the weeks ahead for the Egyptian democratic movement to consolidate its favorable relationship with the Army, to insure that there is no temptation at a rocky point of the transition for top officials to let the police, which has paramilitary capabilities, to revive political repression once the Army is back in its barracks – assuming a departure by Mubarak before the election does not also lead to the reorganization of the police. The resilience of the movement will become sufficient once it begins to view negotiations as critical in sustaining its own long-term ability to mobilize and apply people power, as well as important in setting the terms of constitutional reforms to assure the rights of citizens in addition to free and fair elections. In contrast, in the Chinese crisis, the student leadership attempted to use talks with the regime as a way to reiterate maximum demands and even humiliate regime leaders. That may have aided Chinese hardliners in gaining the upper hand, leading to the tragedy that the name “Tiananmen” came to represent. The Polish regime decided in the late 1980s to have top-level talks with the opposition to resolve the nation’s political and economic crisis, which the opposition accepted because it operated from a position of strength. But also present was a mutual recognition of the importance of the historical moment: that there might be only one chance to reach a compromise that avoided bloodshed and resulted in a radical transformation of the political structure. The strategic logic of nonviolent resistance – particularly the importance of nonviolent discipline - was understood well by the Polish Solidarity movement. Despite numerous provocations and killings, the movement had maintained its nonviolent posture throughout its decade-long struggle. Furthermore, despite the growing strength of Solidarity after its legalization in August 1981 when around 10 million or 80% of the total Polish work force joined the movement, Solidarity had early adopted a self-limiting strategy for pressing political demands. When General Wojciech Jaruzelski introduced martial law in December 1981 to shut down Solidarity, the union went underground and survived – leading to a stalemate between an armed government and a nonviolent popular movement that had not been extinguished. In the second half of the 1980s, with a deteriorating economic situation and growing social discontent manifest in the form of renewed strikes and demonstrations, the communist government had to weigh new options. The flexible strategy of Solidarity was manifested again by its openness to negotiations, but the movement maintained civic rebellious capacity. When the Roundtable met, sitting next to regime representatives was almost the whole spectrum of oppositionists, from conservatives and liberals to social democrats and the main social actors: trade unions, intellectuals and the Catholic church. In the main room of the Council of Ministers office where the round table was set up, 60 negotiators from the government and opposition were seated side by side. The leader of Solidarity, Lech Wałesa, and the minister of interior Czesław Kiszczak, co-chaired the main sessions. The round table discussions were divided into three ‘tables’ for political reforms, economic and social policies, and union and party pluralism. Each table was co-chaired by two representatives – one from the government and another from the opposition. Simultaneously, the more detailed and technical discussions concerning the main themes of the ‘tables’ were taking place in twelve ‘sub-tables’ and in a number of working groups bringing together more than three hundred government and opposition leaders. If negotiators could not agree on some issues they were submitted to higher ‘tables’ for further discussions, and in case the disagreement continued the main leaders were then involved in trying to come to an accord. It was agreed from the beginning that the negotiations would be public and its main sessions televised. Given censorship in media that existed prior to negotiations, the Roundtable gave the opposition an opportunity to present and explain their views openly and reach out to the public. The negotiations took almost two months to conclude. The Roundtable led to legalization of the opposition, the establishment of a bi-cameral parliament with open elections for 35% of seats in the lower chamber and for all seats in the Senate, freedoms of expression and press, and freedom to set up political and civic organizations. Most importantly, the round table negotiations built trust among the parties involved that they would adhere to democratic principles despite political differences and thus led to the peaceful transformation of the Polish state. 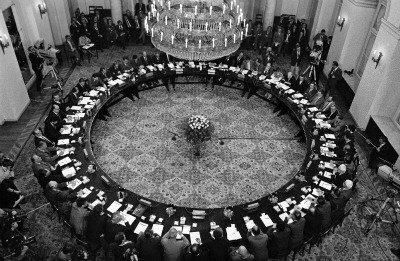 The historic round table talks resulted in a “pacted transition” and the peaceful establishment of democracy well before the Berlin Wall fell and communism toppled in other countries, including the Soviet Union. This was possible because the pro-democracy forces understood the basis of their strength and were farsighted in defining their country as a place for all Poles regardless of historical and political divisions. The same spirit of comity will be harder to achieve in Egypt, because the regime does not so much represent a historical force and political group with a more or less coherent ideological position, as communism did, but merely a corrupt and arbitrary power elite which has simply neglected and marginalized the interests of the poor and the rights of everyone. For Egyptians, it may be hard to recognize, in the faces of those who committed personal as well as political abuses, and who also ordered repression, potential partners in building a new order. But other pacted transitions faced a similar problem, such as in South Africa, where black South Africans justifiably had little interest in compromising with white leaders who had believed they were not entitled to equal rights. Yet the expulsion from society of all collaborators with the old order was impossible, so the question was whether the new political majority had sufficient political self-confidence to permit former regime collaborators to compete on fair terms, granting to their former oppressors the rights that had been denied to themselves. Magnanimously, they did so. In China, pro-democracy activists and the people who rallied to their cause had only a brief seven-week moment in the sunlight of free speech, before the Chinese politburo ordered a violent end to the amazing mass protest. In contrast it took almost ten years for Poles to bring about the Roundtable discussions that took them across the threshold of democracy. During those years they built underground institutions independent of the state and learned how to listen and to build bridges to social and political interests that had not originally been part of their movement. Egyptians have neither the advantages nor the fatigue of such a long gestation in the birth of political liberty. Their public struggle against ‘living in a lie’ under Mubarak has entered only its ninth day as we write this. But it has, fortuitously, already forced their dictator to agree to leave office, and thus far has faced down brutality in the streets, with its spirit undiminished and its momentum unstalled. This show of nonviolent force, affirmed by a largely supportive global audience, will strengthen their hand in the talks that in all probability lie ahead, which will necessarily involve the army and other pillars of the old regime, even if it does not involve Hosni Mubarak and his repressive subalterns. The history of people power has generally rewarded courage, initiative and persistence, but it has also rewarded strategy, tactical compromise, and setting polemics aside when the process of how to reach real power is being negotiated. Victorious are those who not only avoid tragedies such as Tiananmen but who also recognize when it is time to fight, how long it is smart to fight, and when it is time to solidify what has been won. Stephan, Maria J., and Erica Chenoweth, “Why Civil Resistance Works: The Strategic Logic of Nonviolent Conflict.” International Security, Vol. 33, No. 1(Summer2008), pp. 7–44. Zhao, Dingxin. 2004. 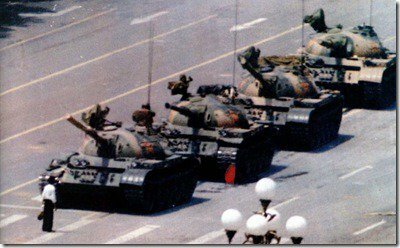 The power of Tiananmen: state-society relations and the 1989 Beijing student movement. Chicago: University of Chicago Press.